In 1593 a fiercely independent pirate woman set sail from Ireland to London to meet Queen Elizabeth 1st of England. 400 years later an ordinary woman from Belfast came face to face with a member of the British aristocracy. Two women… two stories… divided by generations… what connects them? This performance is inspired by the story of Grainne O’Malley, the infamous Irish pirate queen born in Co. Mayo in 1530 and by Janice’s own stories of growing up in troubled times in Belfast. 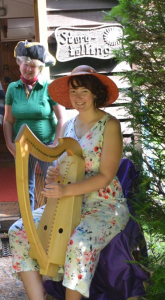 Both grew up in a time of constant clan fighting but Grainne went on to captain her own fleet of ships and become “the most notorious woman on all the western seas”, while Janice went on to become a storyteller! Ultimately this is a story of how “real” meetings can dissolve the barriers that so often lead to conflict. Length : 2 halves of 45 mins each. The first half can also stand alone as a historical tale. 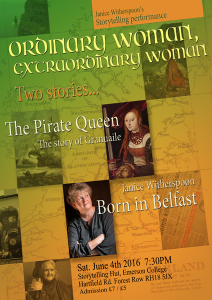 “Janice Witherspoon brings the forgotten history of Ireland’s pirate queen to life with a fire true to her spirit, linking it to her own life story in a poignant and awakening telling. A great celebration of the strength of women, past and present”. Ashley Ramsden, founding director, International School of Storytelling. “This inspiring performance is unique, with both its epic power and personal integrity to speak directly to some of the most important and challenging questions of our time. Janice is a gripping storyteller, who with great humility and a twinkle in her eye, weaves a profound adventure story full of darkness, striving and hope”. Roi Gal-or, creative director, International School of Storytelling. 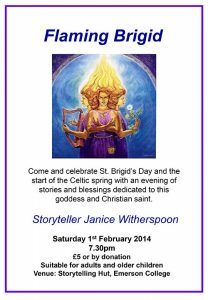 Interweaving song, poetry and story, this performance is a celebration of Brigid, goddess and saint and is especially appropriate around St. Brigid’s Day (1st Feb). It contains stories that tell how she laid her mantle over the earth to bless it and how, every year, she melts the ice so that spring can return. Mother of poetry, healing and smith-craft, guardian of the sacred wells and goddess of fire and the hearth, her three fold flame can still light our path and inspire us today. Length : 1 hour 10 mins. 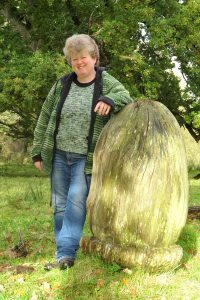 “Janice takes her listeners on a journey that conveys the essence of the land with a passion and love for the stories that the land holds and offers us rich images, wisdom, humour and warmth”. This storytelling performance blends mythology, history and personal anecdote. 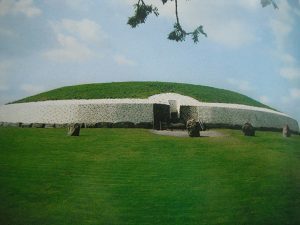 It will take you on a journey through the Boyne valley from the river’s source in the mists of time, past Tara of the Kings and the deep pool where the Salmon of Knowledge was caught, to Newgrange, the home of the old gods of the Tuatha de Danann. The river’s journey will wind through the battlefield of 1690 before continuing on to the sea. Originally devised and performed for the Lifeways Anthroposophical Conference in July 2015. “As a fellow Celtic soul, accompanying Janice when she tells Irish stories feels like a homecoming for me. The tunes take on a richer sound, bringing new feeling and dimension to the words of her heartfelt, engaging and very human stories, while the stories give substance and depth to the tunes. In this performance the audience was able to completely immerse themselves in the world that was created and have a meaningful, rich personal experience. All the above performances are accompanied by traditional music where possible.